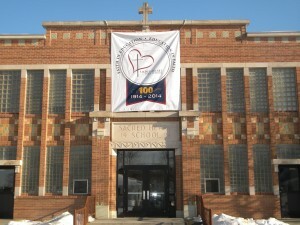 This past weekend, January 12th, the centennial committee hung the school’s new banner featuring its new centennial logo. 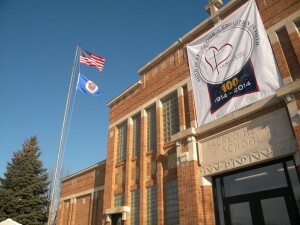 This is just the beginning of events SHAS will have to celebrate its 100 year anniversary. Thank you to all who made this possible, especially Rob Jasmer for creating it and Katie and Nathan Noska for getting it hung up. We are happy to have and excited to introduce to you Miss Ines de la Cruz (Miss Cruz) from Spain. Miss Cruz was a foreign exchange student at Staples High School during the 2009-2010 school-year and has now returned to complete her student teaching/internship. 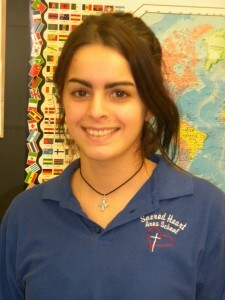 This week she has been observing and helping out in all classrooms. Ms. Cruz will be given various teaching duties including classroom instruction and attending faculty functions as part of her training. She is assigned to our 4th grade class for the formal student teaching experience with Mrs. Trout as her supervisor.